Shelloxy (PC 2124 ) is an elastomeric, water-based anti carbonation and protective coating based on a acrylic polymer. It offers high elongation , resistance to aggressive elements, UV light and rain.It produces a film of hydrophobic barrier,inhibiting the passage of water and water-borne contaminants. It does not require a separate primer. As it is self priming, it consolidates and stabilises porous substrates. Maintains elastomeric performance, with high recovery, even after long term UV weathering. As it is breathable it allows water vapour to escape from the structure. 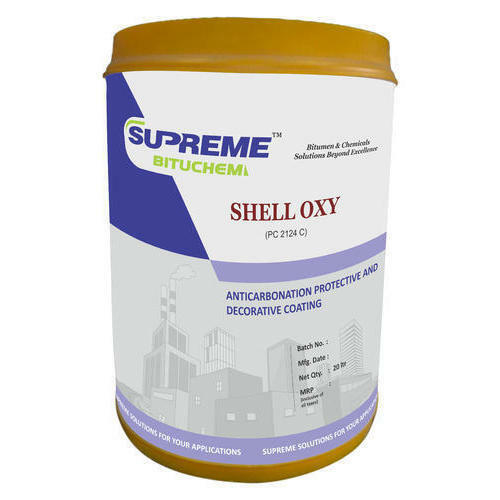 Shelloxy is specially formulated to protect atmospherically exposed reinforced concrete structures above any splash zones from attack by chloride ions, oxygen and moisture ingress, especially where there is a danger of subsequent cracks appearing within the substrate. Following are the recommended application areas: Newand existing structures, Concrete storage tanks - external surfaces, Bridge structures, Coastal environments etc. after the grit blasting process. It is essential to provide an unbroken coating of SHELLOXY. Thus all blow holes and similar surface irregularities should be filled using SHELL CRETE AP Acrylic polymer modified cementitious waterproof coating and should be allowed to cure properly before the application of SHELLOXY . A primer coat is required to penetrate and ‘stabilise’ the substrate. Priming is thus done by diluting SHELLOXY with water in a ratio 1:1. The depth of penetration of the primer, and thus its coverage rate are determined by substrate profile, porosity and general condition. The correct application rates and overcoating times should be observed, in order to obtain the complete benefits of the protective properties of SHELLOXY , except where substrate condition dictates different application rates for the primer.